That particular kind of thunder you hear in the mountains – louder and more rumbly than what I’m used to – woke me up. I drifted back to sleep as a light rain fell. Later on, our little group went into town for breakfast. 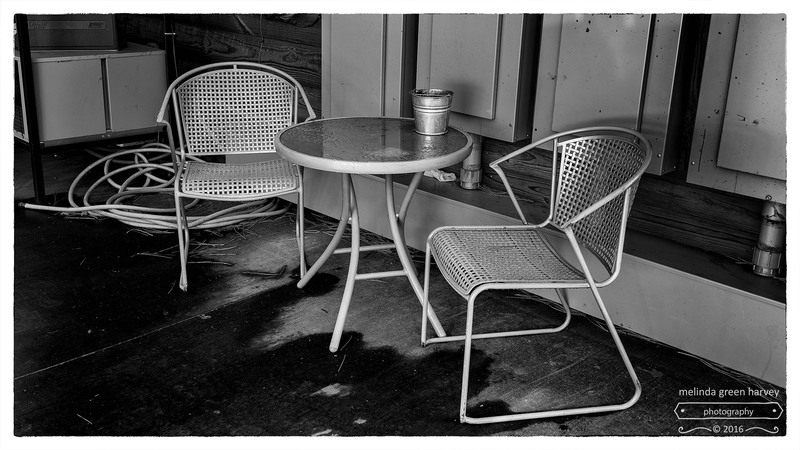 Outside the coffee shop, the furniture was still wet. Posted on October 24, 2016, in Photography and tagged 365 photo project, black and white photography, Leica, melinda green harvey, monochrome, one day one image, photo a day, photography, postaday, Ruidoso, Ruidoso New Mexico. Bookmark the permalink. 2 Comments. Thunder in the mountains can be so dramatic, the sound extended as it echos around. Not nice to be outdoors in it, but in the safety of a hotel a thunderstorm is something to be enjoyed. Our family vacations when I was growing up were almost always camping in the mountains in Colorado (the old-fashioned way – in a tent – but don’t get me started on THAT). We spent a lot of afternoons in the tent, waiting out those brief, but thundery, afternoon rains.